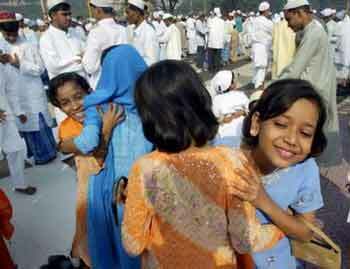 Muslim girls in Kolkata hug each other on Eid. Gorakhpur: Organised by Raz Social Committee, a debate on poetess Parvin Shakir was held under the presidentship of Ehsas Maghari recently. Ehsas Maghari said although doing something against tradition was not an easy task, some women in India and Pakistan took this bold step. Parvin Shakir was one of them, he said. Raz Azmi spoke about the fast increasing popularity of Parvin’s poetry which surprised many. Komal Srivastav said Parvin is a veteran poetess. Her style of narration is worth seeing, said Nazish Rizvi. There is a dramatic ascent in Parvin Shakir’s poetry, Zeba Ghazipuri said. Najibabad: Vice-president of All India Tanzeemul Masajid, Maulana Hifzur Rahman Meeruti has said that no political party till date has given Muslims their rights. Now the leadership will be with ulama who will support the party which assures to get Muslims their rights even if it is BJP, he said. Speaking to media persons, the maulana pleaded that salaries of imams and muazzins in Uttar Pradesh should also be given from the income of Waqf properties as in Punjab, Haryana, Madhya Pradesh and Delhi so that the income of Waqf properties are used properly. Agra: Little research has been done on the literary personalities of Agra and their works including Maikash Akbarabbadi. There is need of a systematic research study on the topic. Speakers expressed these views here at a seminar organised by Bazme Maikash on art and personality of poet Maikash Akbarabadi recently. Shihabuddin Saqib, a senior lecturer of Urdu at Aligarh Muslim University said Maikash has been adjudged as the most unique mystic poet of modern Urdu poetry. He stressed the need of a critical study of Maikash’s works. Dr Nasim Begum presented a brief article on the history of Urdu literature. Sardar Harbajan Singh Thapar, editor and proprietor of Urdu monthly Rahnuma-e-Taleem the only magazine which completed 100 years in Urdu journalism and Dr Ghayasuddin Qureshi, principal of SN Medical College were presented Maikash Awards for Urdu journalism and social services. The award included a memento, a shawl, a silver medal, a scroll of honour and a cash prize of Rs 5100. Student who secured prominent positions in Urdu from 10th to MA were also awarded. New Delhi: The Indian Constitution guarantees non-intervention in the religious rites of Mizos and Nagas who constitute only 16 lakh of India’s population but interference in the religious affairs of Muslims; the largest minority of the country, by enforcing a uniform civil code, is beyond comprehension. This was stated by Moosa Raza, a former IAS officer at a seminar on ‘Uniform Civil Code and National Unity’, organised by Urdu monthly Mahfil-e-Sanam on the occasion of Sir Syed Day celebrations recently. Sita Ram Yechuri of CPI (M) called those who raise the issue of common civil code and ban on cow-slaughter as political opportunists. Former minister Chaturanan Mishra, poet Gulzar Dehlwi, Syed Farooq of Himalaya Drugs and Vikram Kaul also spoke on this occasion. Sir Syed National Awards 2003 were presented to eminent personalities from media, literature, education and social activities. Shehla Nawab, chief editor of Mehfil-e-Sanam conducted the programme which concluded with a verse recitation session. London: Anis and Dabir Academy, London organised an international seminar on ‘Position of Anis and Dabir in Urdu literature’ on the occasion of bicentennial birthday celebrations of Mir Anis and Mirza Dabir. Litterateurs and intellectuals from India, Pakistan, Canada, America, Australia and Britain participated in the seminar. In the inaugural session, Dr Taqi Abidi of Canada presented a review of Dabir’s quatrains. Prof. Muhammad Zaman Azurda presented an article on Dabir’s prose-writing in the second session. Dr Iqbal Mirza presented a comparative study of Anis and Shakespeare. Yawar Abbas of Britain and Prof. Qamar Jahan presented their articles in the last session followed by a poetic recitation. Youths besides senior litterateurs and intellectuals attended the seminar in a large number. Max Unani & Ayurvedic Remedies and Arc Remedies, prestigious Unani Pharmaceutical companies rendered their special cooperation to this programme which was conducted and coordinated by the prominent lawyer of Supreme Court of India, Wasi Ahmad Nomani. Children of New Star College, New Seelampur presented Iqbal’s national anthem. Dr Nafees Jahan, former principal of Zeenat Mahal was honoured with an award on this occasion in recognition of her best services to Urdu. Mohammad Murtaza, Director of New Star College was awarded gold medal for his services in the field of teaching. Roorkee: Though education officers in Hardwar district of Uttaranchal have published Urdu books under DPEP scheme, they are simply confined to children’s sachets. Reason is that many schools have no Urdu teachers. Though there are about 80 Urdu teachers in the district, far less than the requirement, appointment for other jobs does not provide them chance to teach Urdu. Either teachers are appointed in schools which have no Urdu students or their services are utilised for jobs other than teaching of Urdu. Master Dilshad has been appointed in Dharampur village school for the last 10 years and master Aslam has been appointed in a school in Nathu Kheri for the last 6 years but there are no Urdu students in these schools. Bijoli, Zainpur, Jorasi, Khatka, Bhagwanpur and dozens of other villages have no Urdu teachers while there are cent percent Urdu students. All this is being done deliberately under a deep conspiracy in order to eliminate Urdu. Urdu books have been sent to these schools simply to be fed on by termites as Urdu teachers are made to do other jobs. Master Sijid Kamal and Master Talib have been made coordinator of Luxar and Narsan Blocs respectively though they are Urdu teachers. If district education officers are ignoring Urdu, Urdu teachers too are to be blamed for their apathy towards the language. New Delhi: Equal command of religious and modern education is a sign of a better nation. Fear or hesitation in acquiring modern education is the sign of inferiority complex, Maualana Akhlaq Hussain Qasmi said. He was speaking at the annual function of Madrasa Tajweedul Quran. Muslim scientists and experts of different sciences in the past were the products of religious seminaries. When Muslims used to have command of both religious and contemporary education they used to be imams of mosques and teaches in universities at the same time, Qasmi said. In the Indian historical perspective of the last two centuries, he said Maulana Ahmad Saeed, Haji Abdul Ghani, Hussain Ahmad Madani, Maulana Abul Kalam Azad, Hifzur Rahman Seoharwi and a host of other Muslim scholars rendered great services to the nation, the community and the religion. Along with acquiring religious education there is an immense need to get modern education so that there are good ulama besides good doctors, engineers, scientists, lawyers and technical experts, he said. Maulana Asrarul Haque Qasmi, president of All India Talimi wa Milli Foundation stressed the need to read and understand the Quran. He said the Prophet (PBUH) preferred academic needs to household necessities. Students who secured positions were given cash prizes and other gifts. Kerana: More than a dozen people were injured in a group clash between Mallahs (sailors) and Raeens over a trivial issue in Nagla Raeen village, under Kerana tehsil of Muzaffarnagar. According to sources, the two Muslim groups had a violent fight over laying bricks on road sides which resulted in firing and more than a dozen people from both sides were injured. Police forces were posted in the village as a safety measure. Dhampur: Addressing a religious gathering here at Seohara, Maulana Nasim Ahmad Ghazi said one cannot be a Muslim if he harasses his neighbour. It is necessary to obey Allah and his Prophet to be successful here and in the Hereafter, he said and added that in Islam neighbours along with other people have lots of rights. Hyderabad: International Gharib Nawaz Mission convenor, M Baquer Hussain Shaz organised an iftar party for the fasting and other inmates of Chanchalgudda Central Jail on November 21 in the Qutub Shahi Masjid situated in jail complex. Many scholars, intellectuals and religious and political personalities attended the party. The Mission has been organising this function for the jail inmates for the past ten years. After the iftar, Maghrib prayers were led by Maulana Gauhar Hussain.Addressing the jail inmates, Baquer Hussain Shaz asked them to introspect their actions and behaviour and try to follow the right path. He consoled with those who were jailed on false charges and said that there is not much delay in God’s justice and that they will be discharged very soon. He sharply criticised those who throw large and sumptuous iftar parties for publicity but ignore neglected and deserving people. He called upon them to offer namaz even while in custody and pray so that they could be freed soon and join members of their family in iftar party next year. Other speakers also advised the inmates to behave in the jail in a disciplined manner, thereby proving their law-abiding conduct and innocence.